EKG is a pre-amplified electrocardiograph sensor, for directly measuring heart electrical activity. Connects to the body via extender cables for single channel hook up. The EKG sensor is an electrocardiograph sensor or pre-amplifier, for directly measuring the heart’s electrical activity. It amplifies the small electrical voltage that is generated by the heart muscle when it contracts. EKG is similar to EMG (electromyography) which records signals from skeletal muscles, but with a different waveform from EMG. EKG signals are usually measured in microvolts (μV) or millivolts (mV). T9306M EKG sensor package includes the SA9306 EKG sensor and the SA8710M extender cable. T9307M EKG sensor package includes the SA9306 EKG sensor, and the SA9325 wrist straps. EKG wrist straps provide fast, convenient placement of electrodes for measuring EKG from the wrists. Non-latex medical straps are easy to apply, comfortable, and washable; and electrodes are replaceable. Although it is possible to use the EKG sensor with dry electrodes and no skin preparation, doing so increases the chance that artifacts will distort the signal and cause false heartbeat detection and heart rate calculation errors. As a general rule, skin preparation enhances signal quality, reduces artifacts and minimizes the need for post-recording artifact rejection. At a minimum, make sure that before applying the EKG electrodes the skin surface is clean and dry by rubbing it with an alcohol pad. However, to significantly reduce artifacts, we recommend abrading the skin with an abrasive cream, such as NuPrep (10-30), to remove dead skin. If necessary, shave excess body hair. Conductive gel is recommended for optimal electrode-skin contact. Pre-gelled (UniGel) electrodes are easiest, but if using dry electrodes, conductive paste or gel can be applied to the center (on the grey area only) before applying to the skin. Make sure the electrodes are placed firmly on the skin and that there is good contact between skin and electrode. For best results, silver-silver chloride electrodes are recommended for electrical contact between skin and sensor. To get a good signal, a widely spaced electrode placement is recommended, usually on the chest or on the forearms. This requires an electrode extender cable to connect the electrodes to the sensor. To further improve signal quality, we recommend pre-gelled electrodes such as Thought Technology UniGel (T3425M). NOTE: Triode electrodes (T3402M) should not be used because its triangular configuration is not appropriate for detecting EKG signals. Ideal electrode placement for detecting EKG is a triangular configuration on the chest as illustrated, where yellow and blue electrodes are placed parallel to the heart’s main axis. That is, Yellow and Black electrodes should be placed over the right and left coracoid processes, respectively, and the Blue electrode over the xiphoid process. Abdominal Placement: When clients are uncomfortable exposing their chest area, an abdominal placement is an acceptable alternative. Place the Yellow electrode below the ribs on the right, and the Blue electrode at the same level on the left. The black electrode can go anywhere, but a good location is the upper sternum area. Arm Placement: An even easier electrode placement uses the forearms as illustrated. The Yellow electrode is placed on the right arm, with the other two on the left. Ideally, an area with little or no hair is preferred. Arm placement is more susceptible to artifacts, particularly from arm and chest muscle activity. Wrist placement: The forearm electrode placement requires the use of an extender cable with longer leads like the one that is sold with the EKG Wrist straps (SA9325). The wrist straps provide the easiest placement method for EKG signal detection. However it is also more susceptible to movements and EMG artifacts and requires more advanced signal processing. 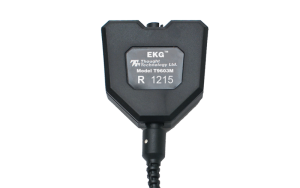 The EKG sensor is designed to coexist with other Thought Technology bio potential sensors such as T9305 EEG sensor, T7680 EEG-Z3 sensor, T9303M MyoScan sensor, or SA9309M Skin Conductance sensor. To ensure correct EKG sensor operation, if sensors from another manufacturer are in the same electrical circuit and connected to the same subject, their electrodes must function at a voltage within the specified operating bias range, 1.0 to 3.0 volts above sensor ground. To check whether another sensor is interfering with the EKG sensor operation, connect and disconnect the other sensor from the subject, and note whether this causes a change in the EKG sensor signal level, or whether connection of the other sensor appears to cause any signal artifacts in the EKG signal. To ensure electrical safety in the user setup, Thought Technology recommends the use of TT Sensor Isolator ST9405AM when interfacing patient connected sensor(s) to line powered equipment(s) or devices. The high pass effect of the sensor’s AC is not shown in the Transfer Function. The function is accurate for frequency components within the specified bandwidth, and should adequately represent the scaling of an EKG signal. The 2.8 V item is present if the TT Sensor Isolator used; it is absent if the EKG sensor is directly connected to a Data Acquisition card, and if a resistor is connected across its output (see section below). Table below lists Thought Technology accessories for the EEG Sensor. It includes: a pair of wrist straps, a long extender cable and 6 replaceable silver/silver-chloride electrodes. Wrist Straps are made of a medical-grade, non-latex material that is water resistant. Straps can easily be hand washed. The UniGel electrode should be the first choice if signal quality is important (i.e., for data acquisition). Three UniGels can be snapped to the yellow, blue and black leads of the extender cable and applied to the client’s chest or forearms, depending on the preferred electrode configuration.